The first resophonic guitars produced by the National String Instrument Corporation in the late 1920s were relatively expensive and highly decorated tricones, aimed at the professional ensemble player. Square neck versions were designed for Hawiian music, popular at the time, and round neck versions for swing bands. These guitars had four to five times the volume of traditional wooden guitars and allowed musicians to use the guitar as a serious band instrument for the first time. However, it was the introduction of the single cone design by "National" just at the turn of the 30s decade that gave the opportunity to mass produce budget models alongside the classier tricone guitars. These single cone guitars, particularly the budget priced steel-bodied Duolian, caught the imagination of street musicians who valued their volume and strident tone. The "National" sound became synonymous with Delta blues - where the guitars were often played in open tunings with a bottleneck slide. The resophonic guitar's haunting lyrical tone, paired with driving bass string rythms, found resonance with the Depression era audience. It is the wide dynamic range and vocal quality of resophonic instruments that still inspires today's guitarists. Young and older players alike are rediscovering acoustic music, moulding diverse genera into vibrant new sounds. Whether you want to reach back to the early days of the blues or take your music in a new direction - the resophonic guitar will provide something both very functional and highly expressive for your live acoustic sessions. Busker Guitars is based in Snowdonia, Wales and is owned by Robin Clark. Robin has been a blues guitarist for many years but a rock climbing accident, causing the partial loss of a fretting hand finger, forced him to rethink his playing. He took up slide guitar and now plays bottleneck blues and lap style on resophonic instruments with a number of local musicians and bands. It was his personal extensive search for good quality, practical resophonic guitars for busking and live performance that led to the creation of Busker Guitars. Whilst many manufacturers carry entry level resophonic instruments, there was a lack of understanding of the important design features required to produce instruments with both the voice and ease of playability required by today's performers. The solution was to partner directly with a small luthier's workshop in China who had a proven record in the field of resophonic guitars and who were open to a collaborative ethos on design criteria. Right from the early days of Busker Guitars, Michael Messer provided advice and guidance. It was a very natural step to work together on the Michael Messer Blues and Lightning projects and to extend the range of guitars available for musicians. Busker Guitars are traditionally built by a small team of craftsmen and craftswomen, givin each one its own identity and subtle nuances. Once in the UK, each guitar is fully set-up in my Snowdonia workshop. And it is this work that is essential to getting full tone and excellent playability from a Busker guitar. As of May 2015 I have setup somewhere around 1000 instruments. I have never managed to complete more than one guitar a day, so that's a lot of time at the bench! 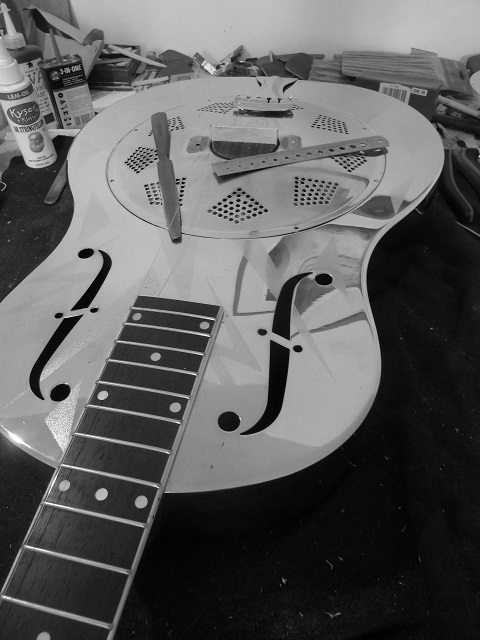 I've learnt a lot along the way and know just where the tone lays within a resonator guitar and how to tease it all out to give every musician a workhorse instrument for the stage and studio. Because I sell direct to musicians the result is the opportunity for me to offer a special product at a great price to UK and European musicians. At Busker Guitars you will get personal service and a pragmatic solution to your resophonic guitar needs. They may be budget priced guitars - but these instruments are well built, set-up for your needs and have great tone and playability. Pragmatic functionlity for live performance has been our driver. And our goal is your musical inspiration!